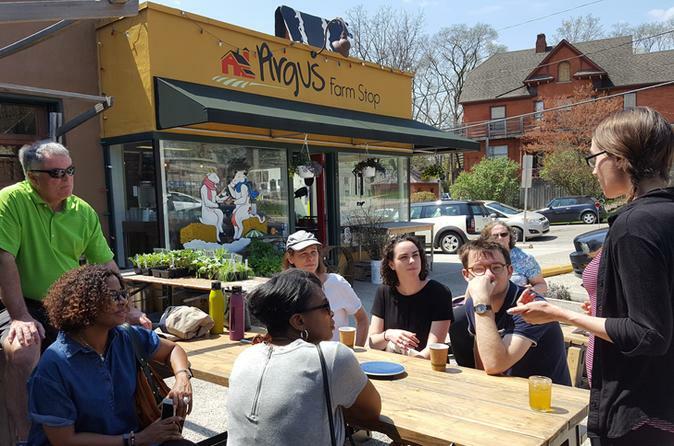 Get on this tour to be a part of thriving Ann Arbor/Kerrytown food scene along with its history and fun trivia. It's an Ann Arbor Classic! Food tastings are enough for a hearty meal. Certain stops include vendor demonstrations, owner interaction and much more! Explore the culture behind the fairy doors. Let's see how many can you spot along the way! Walk away with new culinary perspectives, broad smiles, satisfied taste buds and the confidence to continue exploring Ann Arbor by the sidewalk! On our 3-hour guided tour of the Kerrytown district and Ann Arbor Downtown we visit unique tasting locations. Each tasting location ensures that you will enjoy fresh and exciting flavors. The food samples included are enough for a hearty and satisfying lunch. We sample a variety of foods from an out-of-this-world cuban burger, to a Korean steamed bun which will play with your taste buds. An entirely different take on an Italian appetizer & an extremely simple pizza which will make you crave for more, to a taco with a twist shall transcend you to the streets of Mexico. Nothing can be more satisfying than an adventourous dessert from a local shop to end your meal. We will also be visiting one of a kind, local special food stores which have a lot to offer. Vendor demonstrations, owner interactions, specialty tastings and a brief education on what makes them special will be integral to these experiences. You will leave with great insights and better appreciation for these artisans. Between tastings, you’ll experience the life as a native as you stroll through the historic Kerrytown district and the hustling streets of downtown Ann Arbor. Our knowledgeable and enthusiastic guides illuminate stories of architectural beauty, historic significance of landmarks, best kept secrets in the town and personal anecdotes about how the area became an intriguing neighborhood it is today! They will also provide you with a lot of recommendations for activities you would love to do after the tour. It will be the most interesting stroll you would have taken in a while!